New Zealand Fur Seals (Arctocephalus Forsteri) are the most common seals to be found in New Zealand’s territorial waters. They are indentifiable by having rather pointy snouts and are at risk from loss of habitat, marine pollution, entanglement and competition for resources from the fishing industry. They, along with most seal species, were heavily hunted for their fur and are lucky enough to be making a steady comeback from the brink of extinction. The females will mate about a week after giving birth, even before they go on their first foraging trip. Breeding season runs from mid November to mid January and delayed fertilization enables them to prolong the gestation period to + – a year. The foraging cycle lasts for up to 3 weeks before they return to the rookery to nurse and suckle the pup for a few days. Most pups are weened at 10 months, though some do continue to suckle into their second year. They begin eating solids before they are fully weened and spend much time playing with other pups, bits of seaweed and other random objects. It is during this formative stage that the juveniles, as with other species, learn the skills they need to survive later in life. Males grow to a length of around 2.5m and weigh in at between 90kg and 150kg, while the smaller females grow to around 1.5m and weigh about a third of their male counterparts. 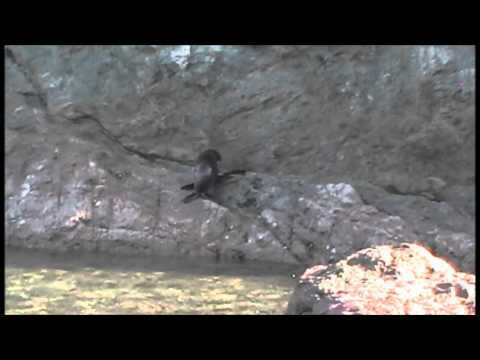 New Zealand Fur Seals are also known as “Kekeno” by the Maori’s. These pointy nosed seals are excellent swimmers and will turn up almost anywhere around New Zealand. One tagged pup released on the west coast of South Island was recorded to have swum as far as Australia. On land, Kekeno tend to become disorientated and end up in unusual places, such as back yards, drains and side streets. They feed mainly on squid, though larger individuals may take on prey such as conger eels. Foraging takes place mostly at night, where these seals use their vibrissae to locate their meals.